Rohn Buser, 16, says he “was born into mushing and has mushed since before he can remember.” He has run the Jr. Iditarod twice, finishing fourth place and second place. In 2004, he was the rookie of the year. 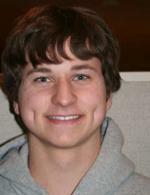 He does cross-country and track in high school and plays tournament paintball and enjoys snowboarding. When he finishes high school, he plans to go to college “somewhere” and wants to do the Iditarod at least one time.